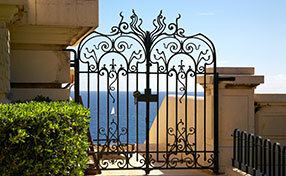 One key issue is that bi-parting gates are the most expensive. As they are split down the middle and move inward, you’ll need two separate opening systems instead of just one. This basically doubles the cost of your opener budget. Not only that, but they’ll need to be properly aligned with each other and when it’s time to maintain them, you’ll need to take care of them both as well. Two motors, two drive shafts, two belt loops – that means that anything that can break down is now twice as likely to do so! You’ll need to be on your toes with a maintenance service at hand. You’ll definitely want to have a warranty with 24/7 emergency service as well. Before you go all-in on a bi-parting system, make sure your property can support it. You need a flat, open driveway, for starters. 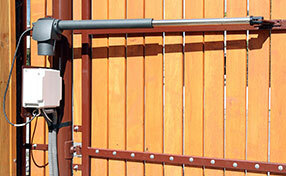 Because of the geometry of the open-swinging gate, you need space on both sides for it to open. Not only that, but you can’t install such a system on a sloped driveway. The angle of the slope means that any outward swing will “catch” on the ground. That’s a no-no. The other thing to worry about is that the gate itself is too close to the road – you can’t have your gate swinging out into traffic, after all. 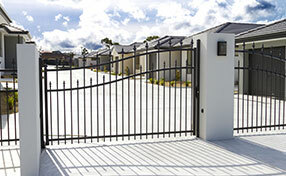 Consider pairing your new bi-parting gate with a classy, elegant looking intercom installation for the icing on the cake.